From a dead battery to a flat tire, there are a few common annoyances that arise when driving a car. One of them is pulling up to the gas pump or charging station, only to discover that the fuel door is on the other side. You probably know where the gas tank is on your own car, but if you’re driving a borrowed car or a rental, you probably didn’t think to check before you hit the road. So, why aren’t they all on the same side? That would be too simple, wouldn’t it? In Canada and the United States, there are currently no regulations that require a fuel door to be placed on one side or the other. Current regulations only outline that the fuel door must be housed at the widest part of the vehicle, opposite the exhaust system, and away from crumple zones. As a result, car engineers place the door on whichever side makes the most sense for the design and function of the vehicle. Things like a car’s audio system, or other big parts and systems, often dictate the position of the fuel door. Studies show, North American drivers tend to favour left-mounted fuel doors for a simple reason. A door on the driver’s side makes it easiest for drivers to park closer to the fuel pump when filling up at a station. Drivers in Japan, the United Kingdom, India and many other countries that drive on the left side of the road instead favour right-mounted fuel doors, for the same reason. As a safety precaution, some people prefer a fuel door that’s on the passenger side, since it would protect them in the event that they run out of gas and need to refuel on the side of the road. The reality is, most car manufacturers make both types. The position of a fuel door is not something that will make or break a sale as much as premium speakers, or other major systems, could. 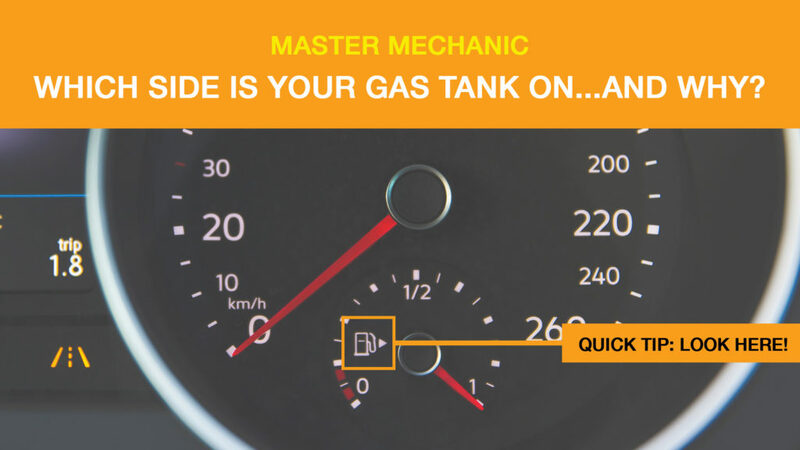 Quick: Where is your car’s fuel door? Off the top of your head, do you know if your gas tank door is on the driver side or passenger side? If you can’t remember the location, there’s a little trick that many people don’t know about. Did you know that the little diamond-arrow on your fuel gauge indicates the side that your tank is on? If your car doesn’t have the diamond arrow, the hose on the icon should tell you which side the gas tank is on. It’s that simple! Now that you know the trick make sure you check before approaching a filling or charging station to avoid frustrating yourself or other drivers! If you have any questions about your vehicle or need to book an appointment for any reason, call your local Master Mechanic today.